Jeff worked with a translator from Brazil to learn "some" Portuguese to enhance his ability to communicate wtih the locals in Natal. He has put together a promotional video inviting people to attend the Romans 12-16 seminar he is teaching in Natal during November. Good job, Jeff! Thank You West Houston Bible Church! view the video the Light in Action team from Brazil put together thanking West Houston Bible Church for our dedication to spread verse-by-verse Bible teaching across the globe. As I start my first solo trip to Brazil, I’m happy to report that the local body of Christ here in Natal is starting to mature and solidify. The team here has organized everything for both conferences at which I’m teaching, from transportation and food to setting the agenda, and every detail in between. 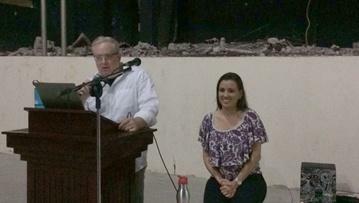 It’s been terrific to show up and teach while the local believers take the lead. Our first conference, called “Sertão Presente” in Portuguese went well. 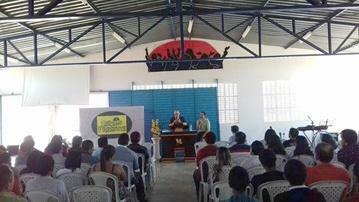 I met with a large group of local pastors and church elders in the town of Acari, Rio Grande do Norte, Brazil. We discussed why we teach verse-by-verse and the sufficiency of Scripture, after which a local pastor named Arlen joined me in presenting some lessons from Romans. The group listened with enthusiasm and invited us to return in April for a full conference– which the local leaders expect to draw an audience of 500! It’s a bit overwhelming to fathom such a large number, but a great encouragement at the same time. The second conference being held in Natal is called “Igrejia Eterna Alinca.” Arlen and I are working as a team for this event, too, teaching Romans 12-16. Including our virtual audience who are live streaming, there are 250-300 people in attendance! An encouraging side note: Pastor Henriques has recently started teaching “versículo por versículo” (verse-by-verse) with his congregation! He makes the fifth pastor doing so since we started visiting. All these things—the support, our encouraging numbers listening to Romans, local pastors adopting verse-by-verse teaching, the local body of believers being introduced to Dean Bible Ministries—it all reminds me that God’s Word is indeed alive and powerful! You too should be encouraged because it is your prayers that are being answered in all this. More to come–and thank you for your prayers and other support that are making this trip possible!